With fall just around the corner, now is a good time to examine your houseplants, those that were outdoors as well as those that stayed inside, for the presence of insect pests. The sooner insects are discovered, the easier it will be to control them. Mealybugs on a rubber plant. Any insects that are missed will continue to feed and can spread to other plants. Keep plants with insect problems isolated from uninfested ones until the pests are eliminated. Most of these insects are small and a hand lens is often helpful in detecting their presence. Check leaves, both the top and the bottom, as well as stems, and remove plant debris from the soil surface where insects may reside. You can also use sticky traps to help detect flying insects, like thrips. 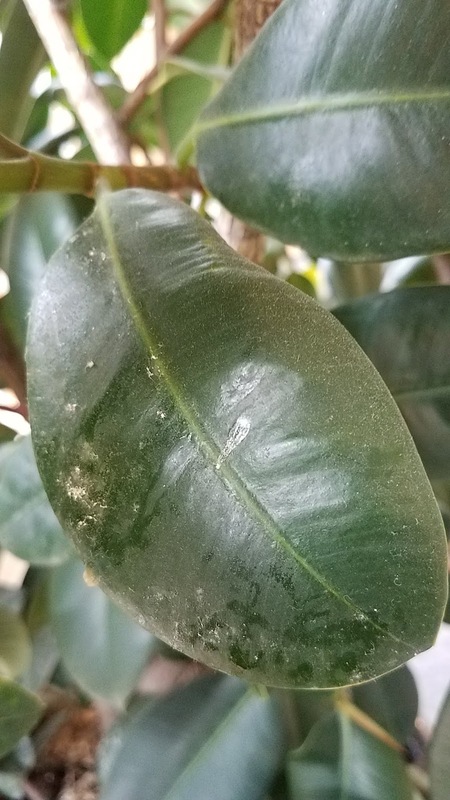 Also, look for evidence of insect feeding, such as discolored leaves, webbing or honeydew (a shiny, sticky substance secreted by some insects). Check under the bottom and along the rim of each container as well, and remove webbing or egg masses found. Use a damp cloth to wipe dirt off containers, and, if used, wash the plant saucer under the container in hot soapy water. If you find just small numbers of insects, you may be able to successfully get rid of them without insecticides. If the plant is small, run cool water over the foliage, tipping the plant so the water spray reaches the undersides of leaves. If a plant is large, stand it in the shower and spray it with water. If your plant has sturdy leaves, try wiping down the leaves with a diluted mixture of mild soap (1/2 teaspoon per quart of lukewarm water) on a soft cloth. You can also try swabbing the insects directly with rubbing alcohol; however, don’t use water or alcohol on plants with fuzzy leaves like African violets, as this can cause leaf spots. If you encounter a larger insect, like tobacco budworms, physical removal it is the only necessary control. Insecticides are an option. Consider using a low impact insecticide, like pyrethrins, neem oil, or insecticidal soap. For heavier infestations, consider a product with imidacloprid. However, because imidacloprid is toxic to bees, do not use it on plants that are attractive to pollinators and that go outside during the summer. Before treating, check the label to be sure the product you intend to use is cleared for use on your particular plant and apply as directed.